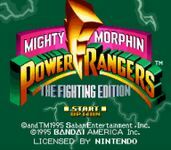 Get ready to rock your world with the Mighty Morphin Power Rangers Fighting Edition, a three mode, smashing, bashing, monster thrashing no- holds- barred slugfest. This one-on-one two-player simultaneous fighting game features your favorite Power Zords and a host of evil meanies. The Thunder Megazord, the Shogun Megazord, the Ninja Megazord, Lord Zedd, Goldar, and many more complete for total galactic supremacy in the mother of all battles. When the dust clears, only one will remain standing. Who will be crowned the mightiest, morphinest warrior in the universe? Only you can control the ultimate outcome.